Clairton Industrial Tool & Supply offers the finest selection of heavy duty OZAT impact sockets. 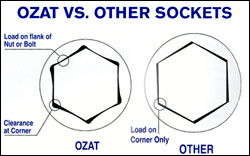 OZAT is a leading manufacturer of impact sockets and feature the "Less Stress" socket design. This design makes these sockets superior to other impact sockets on the market today. OZAT impact socket are manufactured with a state of the art electro-chemical machining process makes it possible for OZAT to produce all of their impact sockets in the less-stressTM configuration. These sockets are designed to handle the load on the flank of the nut or bolt where as other sockets only offer the load on the corners. This "Less Stress" difference results in a longer socket and fastener life and a cost savings to the user. Most impact sockets are manufactured using the normal broaching method to achieve the hex pattern in their sockets, and may have to compromise in their selection of suitable steel. OZAT is able to specify the most perfectly matched material from which to manufacture the most durable and reliable sockets available. The OZAT warranty provides for free replacement, to the original purchaser, of any qualifyii'lg socket found to be defective in either material or workmanship, as indicated by breakage or premature wear. Determination of free replacement will be made after examination by ATP. Impact sockets, by their application, are subject to extreme stresses. Therefore special application sockets such as thinwall, hex driver, In-Star driver, and accessories are specifically excluded from the replacement warranty. Products returned to ATP for warranty consideration must be shipped prepaid, with an ATP returned goods authorization (RGA) number issued by the customer service department. Didn't find the OZAT sockets you were looking for? 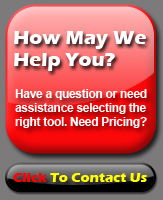 Have a question or need assistance in selecting OZAT sockets?